Dave grew up in St. Paul, MN. There he trained in an ecclectic martial arts style from 1985-1987. From 1987 until 1990, he did not train in martial arts. During this time he was living in Ireland and in Germany. Upon returning to the U.S. he moved to St. Cloud, MN. It was there that he started training under Sensei Tim Kiel. After finishing his teaching degree in German and social studies, Dave moved back to the Twin Cities. During his two years there, he studied under Mr. Hubbard and Mr. Forkey, but he still travelled to St. Cloud for seminars and testing under Sensei Kiel and Master Yataka Yaguchi. In 1990, Dave and his family moved to Brainerd, MN. Dave assisted Sensei Kiel in teaching in Brainerd. 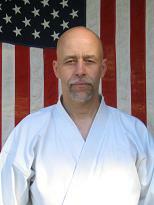 While there, Dave earned his black belt and was eventually entrusted with operating the Brainerd club by Sensei Kiel. During his time in Brainerd, Dave earned his nidan and sandan and has moved the CMK of Brainerd karate club from the gym at an elementary school to a brand new training facility at the Brainerd YMCA. In addition to Dave's regular training, he has also been fortunate enough to have trained under Master Kanazawa, Master Demura, and in dojos in Germany, Ireland, and around the U.S.